Last week the “august” body of the United Nations elected Iran to hold a seat on the U.N.’s Commission on the Status of Women (CSW), a body supposedly dedicated exclusively to “promote gender equality and advancement of women.” This came suspiciously close on the heels of Iran abandoning it’s bid for a seat on the U.N. Human Rights Council. In all likelihood, women and girls were a sacrificial offering to Iran as a appeasement and propitiation for the even U.N. not being willing to allow Iran to have a hand in shaping global Human Rights policies. Of course, to be completely fair, Iran is not really any worse than any other Muslim country. In fact, as repressive and misogynist as they are, Iran’s laws and culture are not nearly so bad for women and girls as some other parts of the Muslim World. 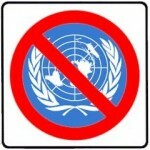 Just disband the United Nations. It is nothing but a corrupt, pathetic, and degenerate gathering of fools and miscreants that has been hopelessly infected and suborned by the despicable forces of Islam and the vermin of the Muslim World. The UN’s rot goes too deep for it to be saved, if it was ever worth saving in the first place. This travesty must be brought to an end. 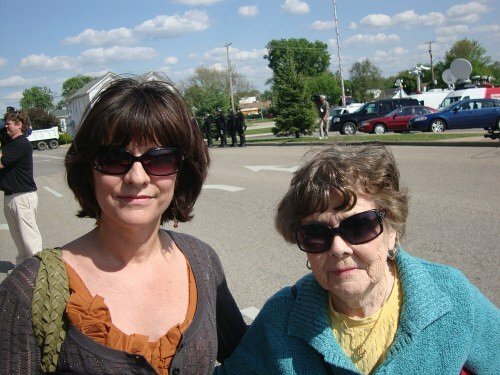 On Wednesday, April 28, 2010 President Obama came to Quincy, IL to deliver a speech aimed at fanning the flames of his Liberals’ class warfare against Wall Street. He delivered his rant at the Oakley Lindsay Civic Center to a crowd that included at least four busloads of supporters brought in from Kansas City, St. Louis, Springfield and Chicago. As one would likely expect, outside the Civic Center some 200 Tea� Party supporters held a protest. What few people expected was the response to this protest by Team Obama. Upon seeing the Tea Party supporters nearing the civic center sometime after Obama’s motorcade had arrived and the attendees of speech had entered the building, they summoned a squad of riot police to deal with the Tea Party. Many Americans are outraged and more than a little scared by the use of such levels of force and intimidation against what was an entirely peaceful protest. The massacres of protesters by agents of the law in Orangeburg, SC, Kent, MS, and Jackson, OH are still, decades later, part of America’s national consciousness. Certainly, outrage is in order, as is a certain amount of well-founded concern for the safety of those who dissent against President Obama’s agenda to reconstruct the foundations of America. But the Obama regime’s recourse of using riot police to attempt to intimidate some 200 peaceful Tea Party protesters is also cause for joy. It means we, the People a making strides in our war to maintain American liberties. The government’s – in the form of Obama’s administration – fear of we, the People was quite in evidence in Quincy, IL. 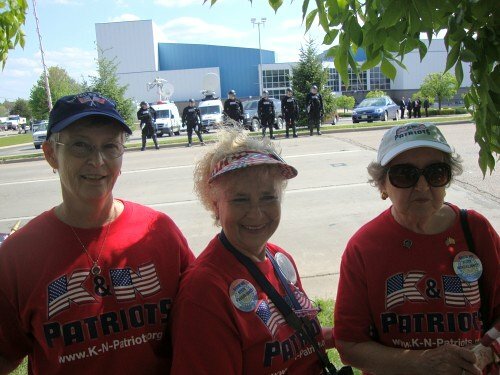 The heady scent of liberty was thick in the air as President Obama’s cadre called out the police from several jurisdictions in full riot gear to quell and intimidate the Tea Party protesters Oakley Lindsay Civic Center during President Obama�s visit. So the American people should be somewhat joyful. We have struck a certain amount of fear into the government. Since fear is one of the few things governments – especially Obama’s pseudo-messianic regime – listen to, this is a sign that we’re winning the war for our children’s nation. 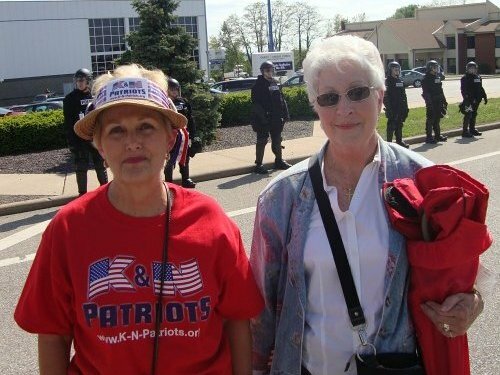 Some people – many actually – have claimed that the police called out to block off and intimidate the Quincy Tea Party were SWAT. This is erroneous at best, mendacious at worst. The law enforcement detail assigned to this event was the Illinois Law Enforcement Alarm System (ILEAS) Mobile Field Force Team (MFFT) 8. They are equipped for- and trained in crowd control not, in the sort of aggressive tactical operations undertaken by SWAT teams. If they had been SWAT the armor would have been largely the same but their weaponry would have been much deadlier and far more in evidence since SWAT teams are used for offensive missions instead of defensive and containment ones. Indeed, even for riot police MFFT Team 8 came significantly under-armed if they expected to encounter any trouble at all – which they at least obviously didn’t. The state legislature of Arizona recently drafted the United States’ most comprehensive, stringent, and potentially effective anti-illegal immigration law, SB 1070, which Governor Brewer signed into law on Friday, April23, 2010. As expected, Liberals and their minority tenants went insane. The Liberals have called Arizona’s new illegal immigrations as being equivalent apartheid, Nazi Germany, and the old Jim Crow laws. Various Leftists have advocated punitively boycotting Arizona and the race-baiting filth, Al Sharpton, ever eager for the self-aggrandizement, has promised to lead riots across Arizona if SB 1070 isn’t revoked. Of course few, if any, of these sorts have bothered to read Arizona’s SB 1070 – the Support Our Law Enforcement and Safe Neighborhoods Act – or compare to current federal immigration laws and their supposed enforcement. Those that have likely don’t care; they’re too steeped in hatred of America, racism vs. Whites, and their own political agendas to worry overmuch about facts that contradict their views. President Obama claims the law is misguided and his Homeland Security Secretary, Janet Napolitano, has parroted her boss’s assessment and added that this is a Homeland Security matter best left to the federal government to solve. 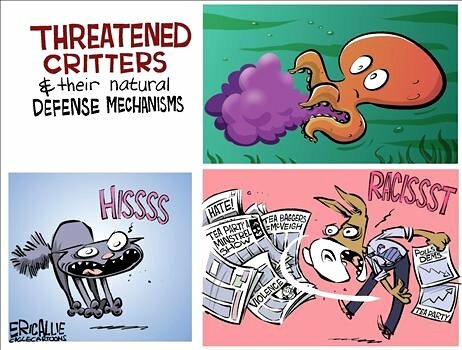 What I find far worse than “misguided” is the fact that no federal administration in decades, irrespective of political party, has done anything except ignore or exacerbate the threat to America posed by our porous and ever more dangerous southern border. They’re ongoing outright refusal to even enforce the laws currently on the books is worse than misguided; it’s criminal and a dereliction of the duties of the POTUS and has been based solely upon political expediency and pandering. Arizona’s Support Our Law Enforcement and Safe Neighborhoods Act (SB 1070) requires through force of state laws that officials and agencies of the state and political subdivisions fully comply with and assist in the enforcement of federal immigration laws and gives county attorneys subpoena power in certain investigations of employers. By and large it does this by making much of the federal code pertaining to illegal immigration part of Arizona state legal code, thereby bypassing jurisdictional issues. Requires a reasonable attempt to be made to determine the immigration status of a person during any legitimate contact made by an official or agency of the state or a county, city, town or political subdivision (political subdivision) if reasonable suspicion exists that the person is an alien who is unlawfully present in the U.S. Requires the person�s immigration status to be verified with the federal government pursuant to federal law. Requires an alien unlawfully present in the U.S. who is convicted of a violation of state or local law to be transferred immediately to the custody of ICE or Customs and Border Protection, on discharge from imprisonment or assessment of any fine that is imposed. any other point of transfer into federal custody that is outside the jurisdiction of the law enforcement agency. Allows a law enforcement officer, without a warrant, to arrest a person if the officer has probable cause to believe that the person has committed any public offense that makes the person removable from the U.S.
if the person is an alien, determining whether the person is in compliance with federal alien registration laws. Disallows officials or agencies of the state or political subdivisions from adopting or implementing policies that limit immigration enforcement to less than the full extent permitted by federal law, and allows a person to bring an action in superior court to challenge an official or agency that does so. that the defendant pay a civil penalty of not less than $1,000 and not more than $5,000 for each day that the policy has remained in effect after the filing of the action. Requires the court to collect and remit the civil penalty to the Department of Public Safety (DPS), which must establish a special subaccount for the monies in the account established for the Gang and Immigration Intelligence Team Enforcement Mission (GIITEM) appropriation. Specifies that law enforcement officers are indemnified by their agencies against reasonable costs and expenses, including attorney fees, incurred by the officer in connection with any action, suit or proceeding brought pursuant to this statute to which the officer may be a party by reason of the officer being or having been a member of the law enforcement agency, except in relation to matters in which the officer is adjudged to have acted in bad faith. is not carrying his or her alien registration card or has willfully failed to register. a law enforcement officer or agency communicating with ICE or the U.S. Border Protection. Stipulates that a person is not eligible for suspension or commutation of sentence or release on any basis until the sentence imposed is served. Directs the person to pay jail costs and an additional assessment of at least $500 for the first violation or at least $1,000 for subsequent offenses. Requires the court to collect and remit the assessments to DPS for the special GIITEM subaccount. Specifies that the trespassing statute does not apply to a person who maintains authorization from the federal government to remain in the U.S.
a class 1 misdemeanor in all other cases. for a person to enter the motor vehicle in order to be hired by a motor vehicle occupant and to be transported to work at a different location. Stipulates that it is unlawful for a person who is unlawfully present in the U.S. and who is an unauthorized alien to knowingly apply for work, solicit work in a public place or perform work as an employee or independent contractor in Arizona. Classifies these offenses as class 1 misdemeanors. conceal, harbor or shield an alien from detection in any place in Arizona, including any building or means of transportation. Stipulates it is unlawful to encourage or induce an alien to come to or reside in Arizona if the person knows or recklessly disregards the fact that such coming to, entering or residing in this state is or will be in violation of law. Subjects a means of transportation used in the commission of a violation to mandatory vehicle immobilization or impoundment. Classifies these offenses as class 1 misdemeanors and subjects offenders to fines of at least $1,000, except that a violation that involves 10 or more illegal aliens is a class 6 felony with a fine of at least $1,000 for each alien who is involved. Allows the county attorney, in investigations of employers who are alleged to have knowingly or intentionally hired unauthorized aliens, to take evidence, administer oaths or affirmations, issue subpoenas requiring attendance and testimony of witnesses and cause depositions to be taken. Exempts proceedings held during the course of a confidential investigation from open meeting laws. Stipulates that an employer is not entrapped in an investigation if the employer was predisposed to knowingly or intentionally employ an unauthorized alien and law enforcement officers or their agents merely provided the employer with an opportunity to do so. States that it is not entrapment for law enforcement officers or their agents merely to use a ruse or to conceal their identities. Directs employers to keep verification records of their employees� work eligibility through E-Verify. This is only a brief synopsis of Arizona’s SB 1070. The full text of the Support Our Law Enforcement and Safe Neighborhoods Act is available in PDF format from the Arizona State Legislature. All of the Gods’ creatures have some form of natural defense mechanism to protect themselves from predators, antagonists, and competitors.